Bold cold hardy bulb that we cherish for its rosettes of huge wide deep purple foliage as it emerges in spring/early summer. 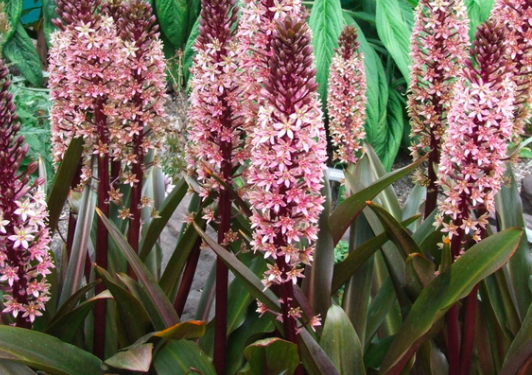 By the middle of the season stems extend from the middle of the plant with unique columns of dense pink/white flowers. On top is a hat of leaves. Reminds me of a garden form of Carmen Miranda. The resemblance is where we get the common name of Pineapple lily. Give this big spreading perennial space. Following the flowers the wide, heavy leaves will turn more greenish and lay down. That means they will swamp any delicate neighbors nearby. At least 2′ of clearance on each side. Multiplies happily in rich, deep soil in full sun. Regular summer water restricts stress and keeps the leaves happily vertical. Long lived and hardy. South Africa.